This year we celebrate the playing of the hugely influential Irish guitar legend, Johnny Fean of Horslips. Johnny will be appearing with Paddy Goodwin and The Holy Ghosts whose members on the night will include none other than fellow Horslips members, Jim Lockhart, Charles O’Connor and Barry Devlin. 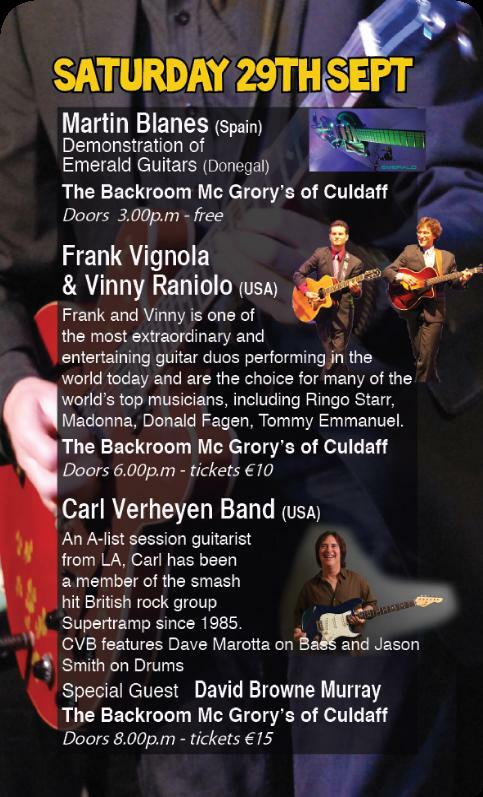 We have an international line-up featuring Supertramp guitarist from the U.S., Carl Verheyen with his band; the highly entertaining and hugely skillful New York duo, Frank Vignola and Vinny Raniolo, Muriel Anderson, of whom Chet Atkins once said “… is a good friend and a great guitarist. She deserves national recognition”. For classical lovers, we have a recital featuring the emerging talent that is English guitarist Manus Noble and the beautiful style of Iclandic guitarist Svanur Vilbergsson. For lovers of Gypsy Jazz and the playing Django Reinhardt we have a special treat with the appearance of French group Gadjo Combo.The festival always likes to feature up and coming musicians and this year we are proud to feature David Browne Murray and Mickey Murphy, both from Northern Ireland and Martin Blanes from Spain who will be on the Emerald Guitar Stand.This year’s festival will also see the official launch of our on-line TV channel on www.iguitar.ie.This years festival will feature school events in Moville Community College and Scoil Mhuire, Buncrana. We extend the warmest welcome to folks of all ages to enjoy a fun filled weekend in one of the most beautiful locations in Ireland.